Keep your racquetball equipment organized and safe with the best racquetball bags on the market. I’m going to show some of the cool bags I’ve seen is past couple of days and also show you my personal favorite. From touring bags to racquetball backpacks, there are a bunch of them. Some of them look very stylish and really know how to draw attention. Apart from that, having a bag keeps all your stuff in one place so that you don’t leave anything behind. Let’s be honest. You don’t really need a backpack every time you go to the gym. If you only have one racquet or pair of shoes that you are bringing to the courts, any backpack or just a basic duffel bag is going to work. Since you are here that means you are looking for racquetball bags specifically so, here are my top 7 picks for the best racquetball bags on the market. The first bag I want to show you is a pretty cool one. When I first started playing racquetball, I didn’t really want to bring a plastic bag with me to hold my paddle. When I saw this head racquetball bag on the gym, I knew I had to get one. It’s a pretty basic grab-and-go bag. It’s also not very expensive. Probably 17 bucks right now. It’s perfect for a quick trip to the court and packs the essentials: pretty standard dimensions, about 22-1/2 inches long, about 12 inches wide and about 1-1/4 inches high. This should be fine for all standard size racquetball racquets. It has a soft and breathable nylon type cloth material case. You can pack your racquet in the main compartment. You can also keep small items like keys, eyewear, gloves, balls, cell phone and keys in the front accessory pocket. You can only fit one racquet in the main compartment. This will definitely fit two, but I wouldn’t recommend it. Good quality material overall and fits the bill perfectly. It looks good and does the job. At this price, it’s hard to beat this kind of quality product from HEAD. You can also use this one as a racquet case and store the bag in a larger bag. Next up on this list the Python Deluxe 3 Racquet Racquetball Bag. Double the price of the head racquetball bag and also double the size. This one can hold three racquets with ease. There is a side compartment that holds all your essentials. In my opinion, it’s a great racquetball bag with lots of room. Enough to keep all your equipment. There are two large compartments that you can use to keep your racquets separate from other items like clothes, shoes, extra racquetballs, etc. Even though the title says that it can hold e racquets, you can easily add another one in there. It is 25-inch long, 7.5-inch wide and 12-inch in height. There is also a large accessory pocket on the outer side of the bag that has a dedicated protective eyewear pocket. A front accessory pocket for keeping small items. If you got wet shoes or other items, don’t worry. There are two ventilated pockets to keep your wet items and footwear. It comes with a removable glove cord and padded shoulder strap. In short, you are getting a lot of feature for the price. 3. E-Force Medium Sports Bag – New Look! 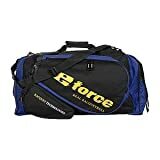 E-Force Medium Sport Bag - New Look! This is an E Force racquetball bag with a slight new makeover. And costs more than the previous two. Well, that’s to be expected because this is a big bag. There are so many pockets that even I couldn’t find them all. The build quality is great and perfect for carrying equipment for four people. This bad is made for racquetball and features an exterior compartment that holds up to 4 rackets. You can even squeeze one more in there. But who would want to carry five racquets? There are also dedicated and ventilated garments pocket and shoe tunnel to keep your gear dry and fresh. A protective and padded compartment that you can use to keep your goggles and protect it from scratches. It comes with an adjustable shoulder strap that makes it easy to carry around the court. The only thing missing on this one is an external water bottle holder. The zipper goes around the top. It is 30-inch long, 11-inch wide and 14-inch in height. It is large enough to hold shoes, balls, clothes, rackets and if you decide to go swimming, you can keep your swimwear, your towel and anything that you want to add and more. It is a very nice bag for the price. 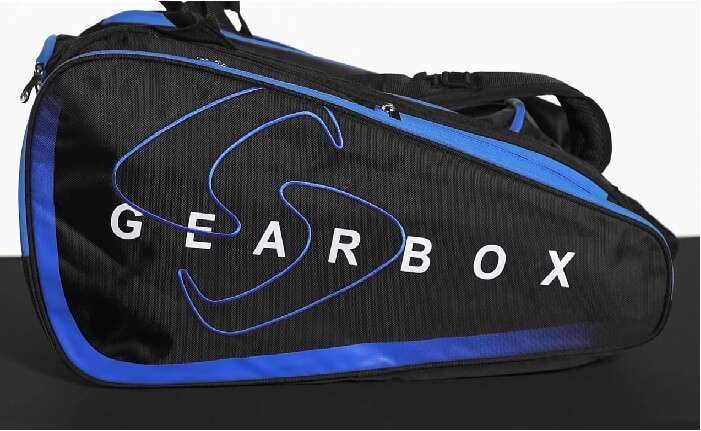 The Gearbox Linux is perhaps the best club style racquetball bag in this list. It can hold up to 6 racquets, and most likely it will not fit in lockers. Dimensions: 17” x 29” x 13”, which also doubles as a duffel bag and backpack. The neon yellow color on this one looks dope. If you have a lot of stuff to carry around the courtroom, this might just be the bag that you are looking for. It has a dedicated shoe tunnel and main compartment divider. This is also the largest bag offered by Gearbox. Among the many new upgrades that this club bag has, the 900D Tetoron fabric is my favorite. This increases the overall durability of the bag. They have also added new heavy-duty zippers and longer glove/headband cord. If you are willing to spend a few extra bucks, the Gearbox Club Bag is the ultimate large-sized sports bag you can find right now on the market. It’s made for gym going racquetball players. You no longer need to carry separate bags for racquets and your clothes. This bag has a spot for everything. The smart design and ample storage capacity make this a perfect bag if you are headed to the courts for the day. Dimensions: L25.5" x W10" x H16"
If you are looking for sports duffels, this “Deluxe” club style racquetball bag from Python is a good choice. It seems well made, and I love the fact that it has few pockets. Fewer pockets mean your equipment won’t fall together, and you won’t have to go digging in order to find a specific accessory. You can easily carry up to 6 racquets in the middle section. There is also a padded outer compartment if you want to keep something well protected. Even after putting six rackets, you will still have more rooms to keep your shoes, gloves, and other stuff. It’s very spacious, but the only downside of this bag is that the floor needs some reinforcement. If you have square cardboard like pieces in the bottom, you won’t have to worry about the support as well as not caving in. It has a double zipper on top and a removable glove cord. The outer pocket can easily hold three racquets, and there is a front pocket for holding water bottles and balls. There is also an eye guard compartment to keep your goggles safe and a zipper compartment on the back to hold extra necessities. In short, it’s a good bargain for the price. This is the Ultra Combi Bag from HEAD which has Climate Control Technology. It keeps your racquets protected from extreme temperatures. This bag has a nice black and white aesthetics that goes well with the logo. The front accessory pocket has got everything you need. Mesh pockets, different organizers and plenty of room for clothes and other stuff. Another small accessory pocket on the top. The main compartment is huge. It has plenty of accessory pockets and can hold three racquets with ease. It has a very durable bottom. You can toss it around the gym, and it will not affect the bag at all. There is also a dedicated pocket for shoes and wet clothes that you want to keep separate from the rest of your stuff. Another accessory pocket just beside that main compartment that’s designed to keep your wallet, phone, watch, headphones, and other small items. It’s a very versatile bag. The last one that is the main attraction of this bag is the racquet compartment. It has climate control technology. What this does is that it preserves your strings from hot or cold weather or anything that’s extreme. 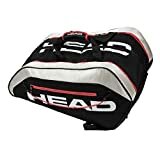 If you keep your racquets and bags in the car with varying temperatures, this is an ideal bag for you: padded straps, glove cords and many more. 27" x 13.5" x 15"
So, we are at the end of this list. This is my last recommendation, and again it’s a Python racquetball bag. It’s medium size bag with one racquet compartment and two front accessory compartments. It has a padded strap for easy carry and carrying handles. It’s a simple tournament style bag with a great price and got every feature you will ever need. The one thing this bag doesn’t have is a divider. You cannot separate dirty from clean clothes. You could pack enough gear for the weekend, and it is perfect for that. Because of space and all the features, this could be your primary bag for club play. The zippers aren’t that great though. That’s all for now. If you want to see how I came up with this list, see this buying guide that I made just for you guys. Picking a racquetball bag isn’t a big deal. All you have to do is look at the durability, storage space, and the design. Go for a larger bag if you need to carry 4 or 5 racquets. If you are just making a short trip to the court, consider going for a small bag that can hold one racquet and other small items. Durability: You need to choose a bag that will last you for a long time. Different manufacturers use different materials. It’s how you handle the bag that will determine how long your bag will last. Size: Bigger bags mean more storage space to carry all your equipment. However, as the size of the bag gets bigger so will the cost. Smaller bags will cost around 15 to 20 bucks. Medium size bags will be well over 40, and larger bags can go up to 100 dollars. Larger bags are also harder to store in gym lockers. Pockets: Having a lot of pockets is a good thing when you need to keep everything organized. A dedicated protective pocket for goggles, ventilated pockets for wet clothes and shoes is mush if you want to go with a larger bag. Comfort: You need to feel comfortable while carrying a racquetball bag. Padded straps are a must because as you pack in all the essentials, it will get heavy. Types Of Bags: If you already own a sports backpack, all you need is racquet cover to keep your racquet safe and protect it from scratches and bumping into other stuff. A tote bag, on the other hand, can be useful if you want to carry smaller items as well. A dedicated racquetball backpack is a multi-purpose bag that’s made specifically for racquetball players. The last one is a club style bag. This is the biggest one of them all and can be a perfect solution if you play a lot of tournaments and need to keep all your accessories in one place. Some manufacturers make larger bags which is kind of overkill for day to day use. It’s up to you to decide which type of bag is best suited for you. That’s all I can say for now. Look, if you got a backpack laying around, that’s perfectly fine. You don’t need to pay a premium to get a racquetball bag. But having said that, if you got two or three rackets that you want to bring to the court, perhaps a pair gloves or goggles, then, by all means, get the best racquetball bags right now. Not only it will keep all your equipment organized but will also keep them safe.